The Pomeranian is a small dog breed, a miniature spitz. It has a rounded, cobby body, an alert, fox-like expression and a signature ruff of hair around its neck. Often stubborn, the Pomeranian needs consistent training beginning at puppyhood. If correctly trained, the Pomeranian can become a good obedience dog. The Pomeranian originated in Germany. Pomeranians range from seven to twelve inches. 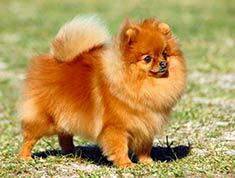 Pomeranians range from three to seven pounds. Pomeranians are typically red, orange, white or cream, brown, blue or black. Pomeranians could also be parti-colored. Pomeranians have a double coat. While the undercoat is soft and fluffy, the outer coat is long, straight and harsh in texture. Their coat requires a daily brushing to keep it from matting. The Pomeranian is a curious, lively and playful dog breed. This dog makes a good companion and enjoys extra attention. The Pomeranian makes a good watch dog and may bark at the approach of strangers and unknown pets. The Pomeranian is susceptible to patella luxation and early tooth loss. The expected life span of the Pomeranian is 12-16 years. Pomeranians are suitable in all environments, whether it be in a house, apartment, city or country. This breed enjoys an active family atmosphere and is a great companion for the elderly. The Pomeranian is in the Toy Group. The Pomeranian, one of many small, long-haired dogs, is perhaps best distinguished from the crowd by his wedge-shaped head, resembling that of a fox. The breed originated in an area known as Pomerania, what now constitutes eastern Germany and northern Poland. In some countries, they are known as the Toy German Spitz, honoring their origins as a Spitz-type of dog. Another part of the dog’s characteristic appearance is the tail that lies up over the back, a hallmark of Spitz descendants. 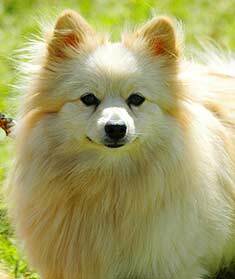 The smallest of the Spitz descendants, the average Pomeranian weighs just 3 – 7 pounds. Keep in mind there is only one breed standard for the dog. 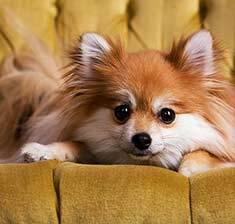 Some unscrupulous breeders will try to sell undersized dogs as “teacup” or “pocket” or “toy” Pomeranians, but there is no such thing. They are all Pomeranians; they just vary in size. Pom’s have a soft, thick undercoat, covered by a long, straight overcoat. The undercoat is shed each year in male dogs. In unaltered females, the undercoat is shed when they go into heat, after they deliver a litter, and when they are stressed. Under all of that fur is a small muscular dog resembling a Chihuahua. Coat colors can include just about anything, including solid black, black and tan, blue, blue and tan, chocolate, chocolate and tan, cream, cream sable, orange, orange sable, red, red sable, sable, beaver, brindle, chocolate sable, white, and wolf sable. As a reminder, sable is when each individual strand of hair has a base color and a different tip color, usually black. The Pomeranian also comes in a merle color, which is where one color is present in several different shades. Finally, Poms with a white undercoat covered with topcoat patches in one or more color are called Parti-Color. The long fur of the Pom requires regular grooming. Daily brushing against the grain of the hair keeps mats from forming and prevents dry skin and dandruff by distributing oil from the skin throughout the fur. Frequent bathing is not recommended, as it will remove the natural oils from the dog’s skin. Trimming is not necessary, as the dog’s fur tends to break off rather than continuing to grow as a Yorkie’s would. 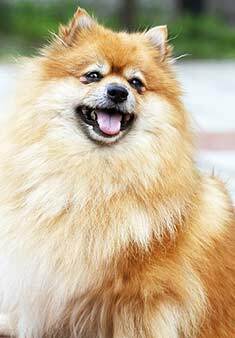 Pomeranians require frequent teeth-brushing, as tartar build-up is common in the breed. Other than brushing teeth and hair, the dog requires very little grooming upkeep. The friendly, active Pomeranian socializes well with other dogs and animals. They love to play, but they can become easily over-heated because of their double-coat, and will often seek out a cool floor for a nap. They may even spill out their water bowls in search of relief from the heat. Remember that this dog descended from sled dogs in northern Europe, and as such is best suited to cooler environments. Their outgoing, excitable nature means they are not typically lap dogs. They would prefer to lay at their masters’ feet, even when the master is moving. You really have to be careful not to step on them! They tend to bark when excited. This trait can be countered by making sure you do not reward the dog for barking. Never, ever ask the dog to “speak” for a treat, and don’t give the dog a treat to try to get him to pipe down. Because they are so small, many people may feel that these dogs would be great with children. Not so much. 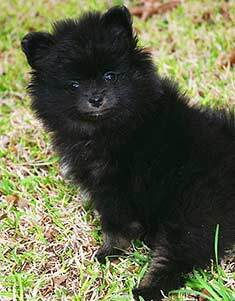 If a Pom puppy is brought into a home with small children, he will adapt, but adding a child to the home of an older Pomeranian is not always such a good idea. Pomeranians have been popular dogs throughout history, most recently placing in the top 15 registered breeds with the American Kennel Club. Michelangelo reportedly had a Pom who watched him paint the Sistine Chapel. Sir Isaac Newton had one, but we’re not sure how popular she was after she tipped over a candle on his papers, destroying 20 years of research notes. Other famous Pomeranian guardians include Mozart, King Edward, Queen Victoria, Marie Antoinette, Harry Houdini, and Charles Darwin. In pop culture, Poms have been sighted with Paris Hilton, Nicole Richie, and Sharon Osbourne. The Pomeranian generally lives from 12 – 20 years, with very few health problems. Like many toy-sized dogs, Poms can suffer from patella luxation, where the kneecap slips off of the femur, causing pain and temporary lameness. When the quadriceps muscle of the thigh relaxes, the kneecap slides into place, and the dog walks normally, until next time. Some dogs may be afflicted more severely, requiring surgery to return the patella to its normal position and anchor it there. This problem is generally more severe in dogs who are overweight or have suffered injuries to the hindquarters. 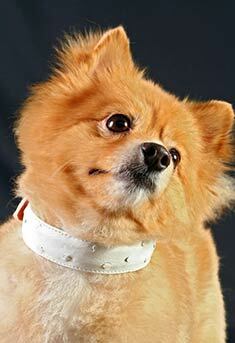 Another health problem that may affect Pomeranians, particularly if they are overweight, is a collapsing trachea. In this condition, the trachea partially closes. Under normal circumstances, the dog acts just fine, but when excited he will cough or make a honking sound as he tries to move a higher volume of air through the compromised opening. For the most part, the adorable, outgoing Pomeranian makes a wonderful companion. Although you must make a commitment to keep up with his grooming, the friendship you will gain will be well worth the effort! Could Michelangelo, Mozart, Harry Houdini, and Paris Hilton have all been wrong? Find Pomeranian Puppies with our Free Breeder search!